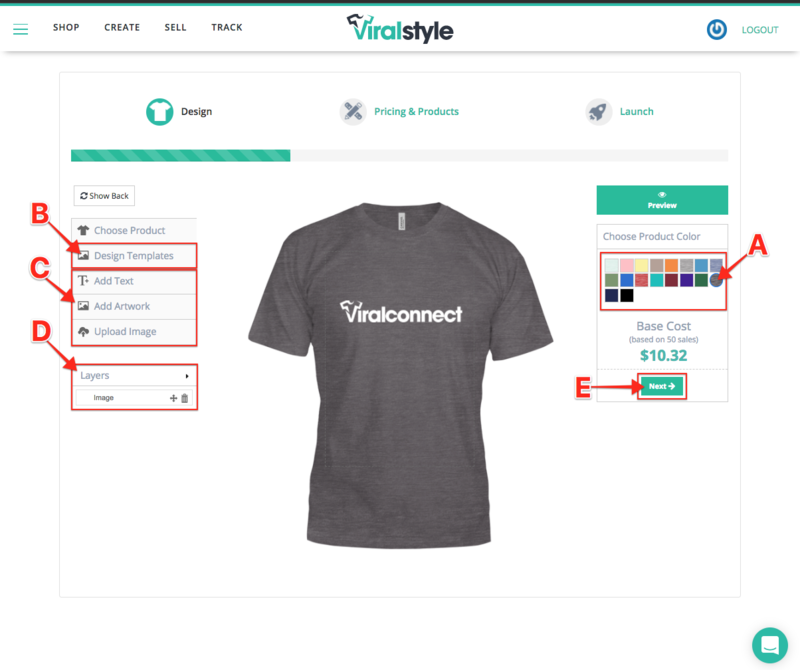 Click the "Create" button underneath the Viralstyle "Home" button (top-left logo). Choose a product category. For this example, we'll select the short sleeve category here to start. 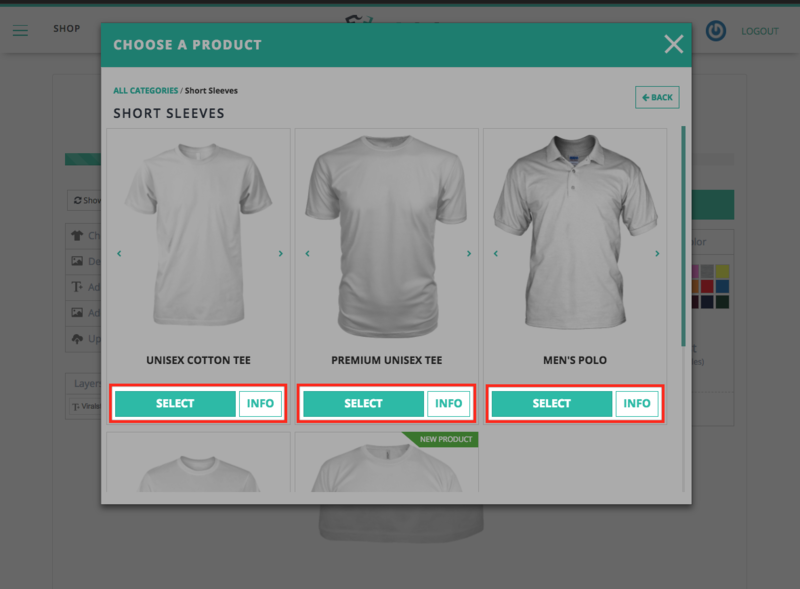 Choose your garment in this category by clicking the "Select" button. 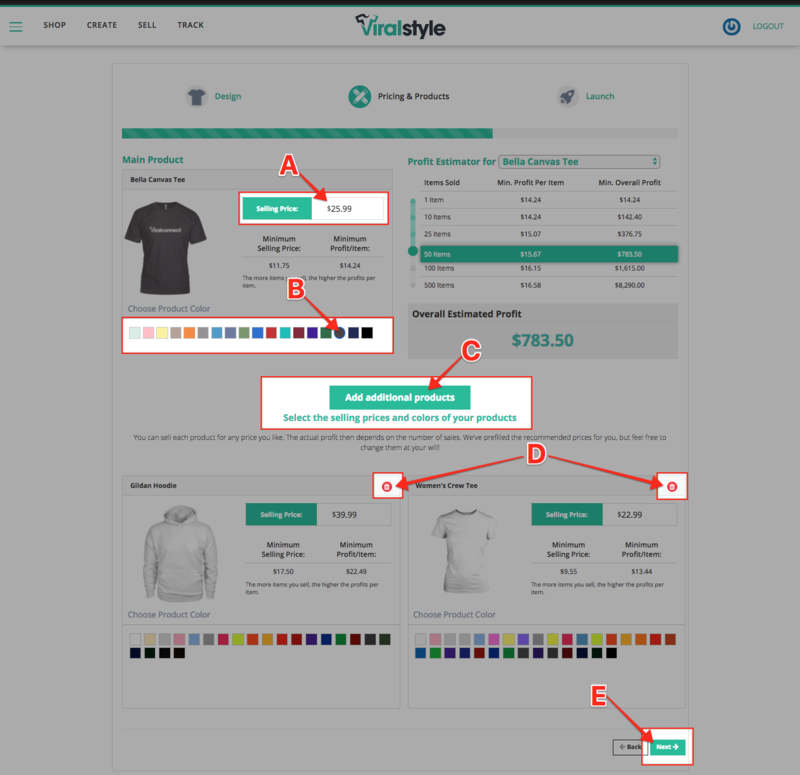 Click the "Info" button to see product details, design guidelines, colors supported & sizing/measurements. a. Choose your product color. b. Download free design templates which will help you create & size your designs before uploading. c. Add text, add artwork or upload your own image (see designer tools below). d. Adjust or delete layers until you've got everything to your liking. e. When you're ready to move on, click the "Next" button on the bottom-right. a. 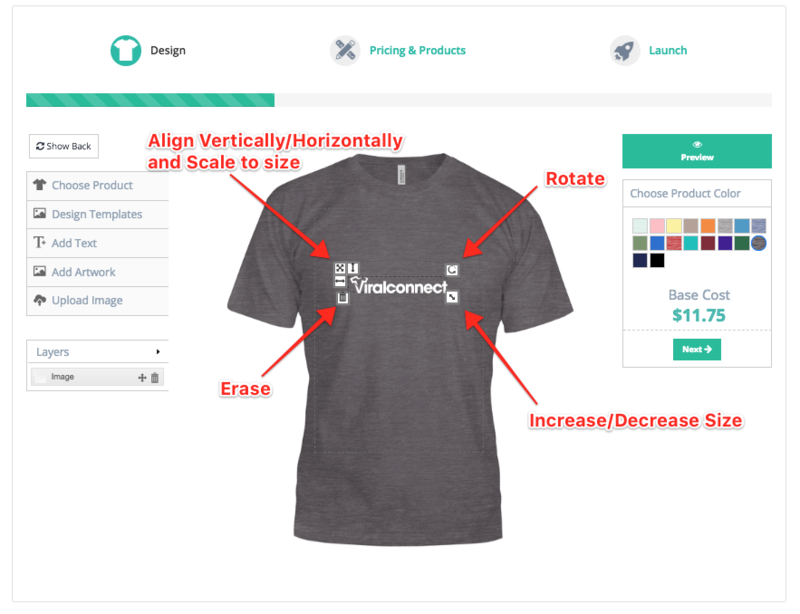 Adjust your selling price to meet your desired profit per item sold. b. Add additional colors by clicking the squares. Once selected, the squares will turn into circles. c. Click "additional products" to add garments to this campaign. Repeat steps A & B for the additional products added. d. Delete additional products if necessary. e. Click the "Next" button on the bottom-right when you're ready to move on. Note: we will add your design to the "additional products" for you. We'll adjust the designs size & location to best fit the garment size your customer orders. You do not need to see the design on the additional products to proceed. URL: The URL will pull the campaigns title by default, but you can update if necessary. Categorize Your Campaign: Make it easier for potential buyers to find your campaign in our Marketplace. 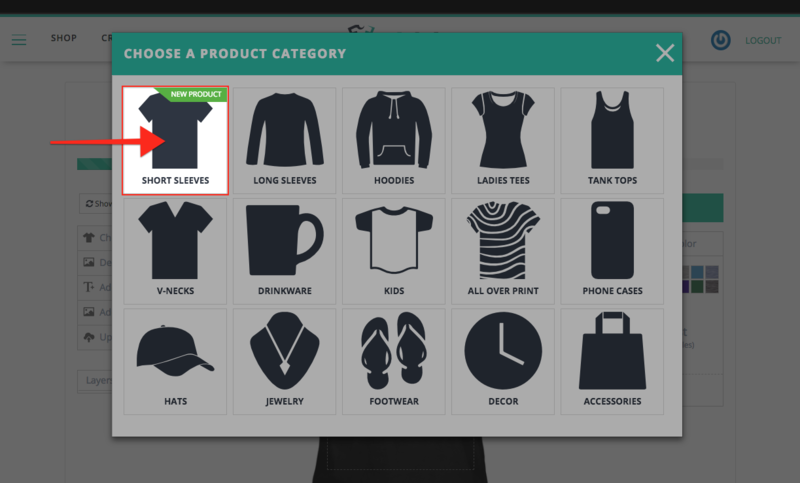 Tags: Allow you to automatically add campaigns to a storefront with a specific tag. 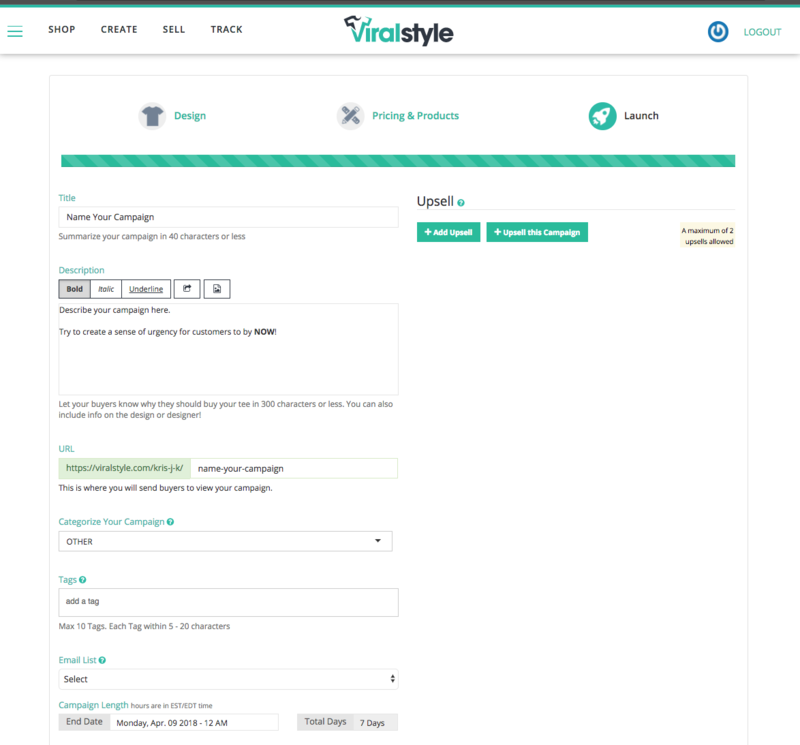 Email List: Viralstyle give you full access to your buyer data. Your buyer data will automatically transfer to the list on the email marketing provider you choose. You can also choose this list after the campaign has already launched. Campaign Length: Decide how long you'd like the campaign to be available. This cycle will repeat if you leave your Advanced Settings on "Auto". Upsell: This is a great way to allow your customers to purchase related items at checkout with ease. You may attach up to 2 upsell products to each campaign. When your customers successfully make a purchase and reach the "thank you" page, the upsells will appear in a pop-up. The customer can then choose additional products and add them to cart, using their shipping and payment information already added. Advanced: Hover above the "?" for more information on each advanced setting. By default, advanced settings are evergreen. This means that they'll relaunch or extend automatically. Agree to our terms of service by checking the box. Launch, Save as draft or go back to make adjustments.